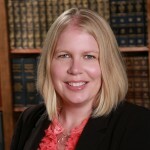 This post originally appeared on Religion Dispatches. The day before the inaugural jumma, Friday congregational prayer, at the Women’s Mosque of America, M. Hasna Maznavi, who serves as the project’s President, was busy with last minute event planning and logistical details. Her dream to create a mosque that welcomed and empowered women was on the verge of becoming a reality: “I was anxious before but I’m not now; everything is falling into place,” she told me. That optimism was no doubt bolstered by more than 225 RSVPs from prospective attendees as well as the growing media attention that their work was attracting. 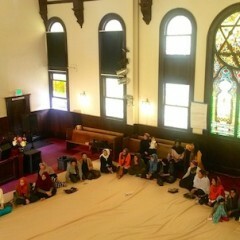 Just after 1pm on Friday, January 30, women sat side by side on the cloth-covered floors of the Pico-Union Project—once a synagogue, then a church, and now a multifaith center. All but a few pews remained on the sides of the room, where observers from other religious traditions, reporters, and a few Muslim women were seated. It was the policing of women’s bodies and limiting of their spaces within mosques that gave Maznavi the final push to transform what she called “her life-long desire to build a mosque” into a specialized religious congregation that made women feel comfortable. After a positive, welcoming experience growing up in the Garden Grove mosque in California, her childhood mosque was renovated and the women’s prayer space was moved upstairs. Maznavi was told not to pray downstairs. “The architecture slowly trickled down to the culture of the place,” said Maznavi. That religious institutions are the source of spiritual disaffection is a both common refrain and a contributing factor to the growing pool of religious nones—especially among millennials. 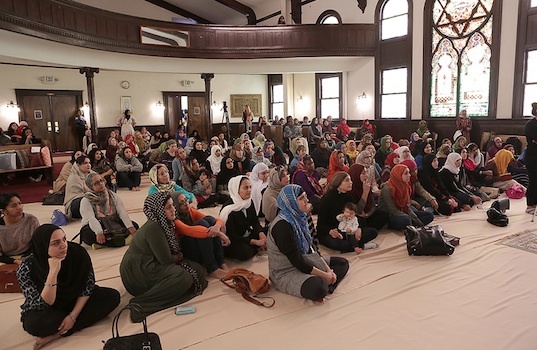 Instead of sliding out of the door of congregational and religious life, the organizers behind the Women’s Mosque have channeled their energy into a creative, institution-building endeavor, aimed, in part at stemming that trend. And it seems to have resonated. “I would hope that women who do not go to the mosque or those who don’t feel comfortable when they go, will find [that this is a] place for them to go,” remarked Zaria Horton, who also attends a mosque in nearby Pasadena, CA. That is what is so strikingly unique about the work that Maznavi, Muttalib, and their collaborators have undertaken. There have been previous efforts to radically push the limits of the American Muslim community, especially around gender-inclusion—most notably Amina Wadud’s and Asra Nomani’s women-led mixed-gender prayer a decade ago. But the Women’s Mosque consciously frames and anchors the project not as groundbreaking, radical, or revolutionary, but as an one squarely within the orthodoxy of Islam, even if that claim is contested. Edina Lekovic, who gave the khutbah (sermon) during the service, noted that there were women’s mosques in ten other countries around the globe. “We respect the orthodoxy and we also want to push it,” Maznavi said. Los Angeles itself has long been the starting point for movements that challenge orthodox religious teaching, including historic events like the Azusa Street revival, which sparked an American wave of Pentecostalism more than 100 years ago. Today, Los Angeles is home to a large and diverse population of Muslims including recent Latino/a converts, and the children and grandchilden of immigrants and those who found Islam originally through the Nation of Islam. So it is not surprising that the Women’s Mosque was planted in LA’s fertile spiritual soil. The inauguration of the Women’s Mosque of America is one marker of an important turning point for American Muslims, whose communal efforts have struggled during the post-9/11 cultural climate. Those behind the Women’s Mosque of America are all men and women in their 20s-40s. They have not succumbed to the suspicion or outright hostility of those who question their place in America as Muslims. Nor do they feel the need to proclaim themselves “moderates,” or to engage in self-defensive posturing in reaction to external pressure. That in and of itself may signal a change in the way this younger American Muslim generation approaches their religion. While these younger American Muslims are acutely aware of the shortcomings of their own religious institutions, they are not spending their energy to make a project of critiquing the faults of those places. Nor are they patiently waiting for those institutions to awaken to their needs—they are not pleading with traditional holders of authority to lead change from on high. Instead, they are empowered by self-confidence and a sense of ownership of their identities and their religious tradition—and they are at home in the city they call their own. They are adding to the ingathering of creative energy that is creating what Edina Lekovic and others have called “a renaissance” in American Muslim life. *Full disclosure: Hasna Maznavi, Edina Lekovic and Sana Muttalib were all participants in a program I advise called the American Muslim Civic Leadership Institute. I have been friends and colleagues with Lekovic for a decade.